Since Hurricane Sandy is threatening to knock out electricity for days at a time, and since we have a bunch of disposable size 2 diapers that need used up before our little tank grows any bigger… we’re switching to disposables this week so that we don’t end up with a basket full of dirty diapers and no electricity or hot water to wash them. I also have no idea what to cook/eat when the power is out. My only notion is that we will need to use up everything in the freezers when it all starts to thaw. What do you make when the power is out? The words hit me like a brick wall. They’re just the attitude adjustment I need today. They take me back to my bible quizzing days. We spent a whole year studying 1&2 Corinthians. I knew the answers, but I didn’t truly understand the impact of the words. love, I am only a resounding gong or a clanging cymbal. No matter what I do, if I do it without love, it’s worthless. If I sing without love, it’s just hollow noise. I sing the songs because I know the words and remember the tunes. Do I sing with love or do I waste my breath? If I do my housekeeping without love, I leave a bitter taste. I get angry because no one is helping me, or because no one says “Thank you”. I’m bitter because I go to work, then expect to keep house like I’ve been home all day. If I write without love, am I just a clanging cymbal? Just another repetitive homemaking blog? Look at our menu for this week. Clang. This is how I clean. Clang. Clang. Try this new recipe. Clang. This is our daily routine. Clang. Clang. It’s so easy to let passion turn into mundane. The fire fades and I keep pushing. My excitement turns to routine. My mind wanders and I’m on auto-pilot. I start to settle for “good enough” instead of my best. The work starts to look like a burden. The radio announcer said today, “Love should never be a burden.” Think about that. It’s true. If you love something, how could you ever see it as a burden? But, isn’t the converse true? If we see something as a burden, we’re not doing it with love. How can we be the loving people God has called us to be, when we’re whining and complaining about these “burdens”? Raegan’s transition to day care was a breeze. She goes twice a week, and I get to stop by and see her on my lunch break. I nurse her when I drop her off, during lunch, and when I pick her up. She doesn’t like the bottle, and she gets enough time nursing during the day, so her teachers use the milk I pump to make cereal for her. She’s loves the cereal!! Nursing less and eating more has changed our diapering routine a little. Raegan can go days without a BM. 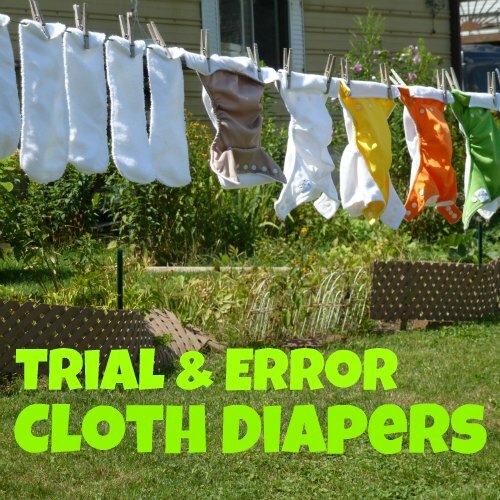 Not that dirty diapers were much different from wet diapers (I don’t dunk or spray dirty diapers, just an extra rinse in the washing machine) — but it does mean less stains, now that it’s cold and I’m not using my clothesline as much. The way the sun bleaches diapers still amazes me. And, I need to figure out a way to keep doing it through the cold winter months. Raegan wears disposables at day care, which usually amounts to about 3 diapers each day. The day care is very nice about letting her wear a cloth diaper in the morning so I don’t have to keep a pack of disposables at home. Speaking of disposables… we had to travel, unexpectedly, this week to be with family a few hours away from home. I thought about taking the cloth diapers with me. It wouldn’t be difficult. I had access to a washer and a dryer. But, I was tired and we didn’t know how long we were going to be staying when we packed. So, I ran out and bought a pack of disposable diapers to take along. Raegan had a rash within 24 hours of leaving the house. The weird part was, the rash wasn’t wear the diaper covered. It wasn’t a rash from not getting changed or from the chemicals inside the diaper. The rash was down the inside of her thigh, from where the plastic-ish outer layer of the diaper rubbed her legs. Some diaper rash cream and snug-fitting leggings cured her quickly. One night, we were all snuggling before bed, and Landon said, “Raegan needs her diaper changed. It smells.” I checked. She was dry. Disposable diapers smell. I notice it when I walk into the nursery at church. I can’t explain the smell, but it’s there. It’s something we weren’t used to. Maybe I should have taken the cloth diapers. At least it was a learning experience, and it gave me time to think about more important things. But, it was a good reminder that we use cloth diapers for her benefit, not just for ours. Yes, it saves us money, but it’s also much more comfortable for her.